The first recording of computer music? The recording has been unveiled as part of the 60th Anniversary of “Baby”, the forerunner of all modern computers. The Nord Modular was the first major synth hardware with required software for programming it. It was extremely powerful. I own two! It was also the gear that soured me on the whole idea. Why? Because, Clavia never upgraded the editor to work with OS X. There was a beta release, but it didn’t work that well. So now, that very expensive hardware is mostly worthless. Luckily, some bright hackers decided not to let it lie: Nomad is nord editing software written in Java for OS X, PC and Linux. What would have been better would have been if Clavia had released their software as open source, so that folks didn’t have to reverse engineer it. This is why I won’t ever buy a Nord Modular G2, by the way. U.S. Album Sales Fell 9.5% in 2007 (New York Times): when the year’s top albums are Josh Groban’s Christmas music album, a High School Musical soundtrack and the Eagles, why is anyone surprised that sales are down? Sony BMG Plans to Drop DRM (Business Week): The last major label hold-out on DRM has finally realized that punishing your customers is not a good business strategy. I’m sorry I didn’t post a link to this sooner. This is a nice perspective on the whole digital music landscape from the boss over at Yahoo Music. We’ve heard from the major labels and we’ve heard from the retailers, but Y! has a different view which is interesting. I’ve followed this since the beginning. I started Unit Circle Rekkids right near the start of the Internet’s explosive growth period. I saw different digital solutions emerge and fall by the wayside. After getting burned on Liquid Audio (if you can imagine, back then you paid them (A LOT) for the software to encode your music so that they could sell it and take a cut). Over the years, digital distribution has changed from an interesting idea to I think the best solution for indie music. If we can get the majors to get over themselves, I think the days of manufacturing CDs are at an end. So, I finally bought the Zoom H2. I’d been dancing around it, but I had a trip to Chicago looming and I really wanted to be able to do some location recording there. I decided to buy an H2 and see how well it worked. Overall, I’m pretty happy. There are some good points and some bad points, but around this price point ($200), you can’t really do too much better for the features. I’ll cover those in a moment, but I do need to make on caveat: I’m using this for a bunch of different things, but mostly for doing ambiance recording and this review is based around that use case. I haven’t tried using the H2 to record a band or an instrument or anything like that. I did use it to record my talk at MAX and also a coaching session for that talk, so I can speak to it as a lecture recorder or something similar (and I will). This is also not an exhaustive review. For that I recommend the review on meefedia, which was recorded on the H2. 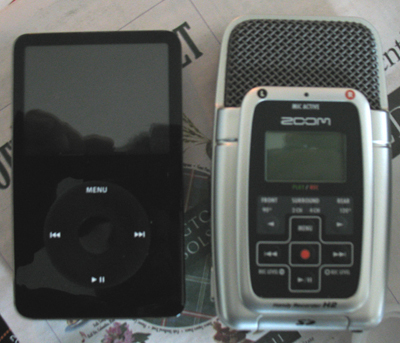 The H2 next to a 80GB IPod. The H2 on top of the 80GB IPod. 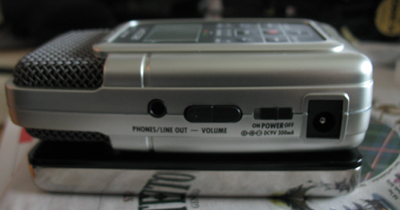 The H2 is a bit longer, a bit more narrow and double or triple the width of an IPod. This is pretty reasonable and is totally jacket-pocketable. It is also quite light weight-wise. It feels lighter than the IPod, which would make sense since it doesn’t contain a hard-drive. You can put the H2 on a bench or a chair or something and not attract a lot of attention (which I like). With options for both compressed and uncompressed recording with sampling rates up to 96 KHz and depth up to 24 bits, you are well covered in the output area, what about the DACs themselves? I found them pretty good, reasonably flat and clean. You are obviously making a trade off in cost vs quality here, but the technology overall has improved so much over the years that the H2 sounds pretty good. Amazing, actually, for something so small. For all the sound samples below, I used the built in mics: both the front and rear mics. The mics were also decent. I have external mics that would work with the H2, but I haven’t tried them yet. Below are some samples from some recordings I made at Millenium Park in Chicago. Unfortunately, when I made these clips in Soundtrack, it converted them all to 32bit float instead of preserving them at 24bit integer as they were recorded. Rather than convert them back to 24bit (introducing any processing that might alter their character), I deliver them as 32bit float (which is not supported by the H2). There has been no processing to them beyond the 32bit conversion. All of these were recorded at 48KHz/24 bit using the rear microphones (120 degrees) with the exception of the 4 channel recording, all of them were also recorded with the H2 on a small tripod (not the included one). I don’t care if your batteries last 14 hours. If I can’t go to a store and buy some new ones when the batteries die, I’m going to seriously consider your device disadvantaged. My camera takes AAs and the H2 does as well. When I ran down the batteries right before my trip to Millenium park, I went to a corner store and bought some more. EASY. IT SHOULD ALWAYS BE THAT EASY. The lack of replaceable batteries was a disadvantage in my mind to all of the other portable recorders on the market, including the H4. At this price, you can’t ask for too much, I guess, but the plastic case and chicklet keys do not convey a sense that this device was built for durability or long life. On mine, the USB port doesn’t completely line up with the hold in the case for it. It isn’t a problem, but it isn’t screaming “quality control” either. This isn’t an issue unless you are someone who likes to carry the recorder around in your pocket while monitoring with earbuds and recording with an external microphone like I do. For me, it is a serious design flaw. The headphone jack is on the left side of the unit, the external mic jack is on the right side of the unit. This means that unless your headphones and your microphone have right-bend jacks (which few do), this thing will take a bunch more space in your pocket and you’ll risk damaging the jacks any time you try to remove the device or insert it into your pocket. Given the size of the thing, I don’t know what other options they had, but it is an issue anyway. Contrary to other reviews, I don’t think the usability on this is that horrible. It certainly could be better, but it isn’t that hard to change settings and do typical things. A couple exceptions: the first press of record puts you into monitor mode, not record mode. This messed me up a few times as I was first using the device. I’m used to monitor mode being the weird thing. This is just a matter of training yourself. The second issue is that the startup time is a bit slow. It could be worse, but if you are carrying your H2 around and then you hear the clock start to chime and you really want to get a recording of it, you better hope that it is pretty late in the morning or night, because otherwise the H2 starts up too slow. I’ve been looking for a while for something to replace my mini-disc as my dedicated field recorder. The H2 gives me the quality I need with the features I like at a great price. I’m keeping it. So, Van Halen’s backing synth tracks were played back at the wrong sample rate during their biggest hit, and then it all goes horribly, beautifully wrong. I was reading about the boomchik when I came across this page on Roger Linn’s site about instrument design. Nice to get his take on some of these old and new ideas.